Photo by Miles Boyer“When I first walked into the home and looked at the foyer and up the stairs, I said, ‘This is it, I want this house,’” Amy says. “It has a very beautiful foyer.” The crystal chandelier in the space came from the Landers’ East St. Louis Street home, and the white oak wood floors were installed when the house was constructed in 1939. “We kept all the floors,” Amy says. “We just had to refinish them.” For the holiday season, Amy decorates the stairs with a garland of greenery, magnolia leaves and other seasonal elements by The Thicket, and she decorates the buffet server with golds and whites in a woodland theme. 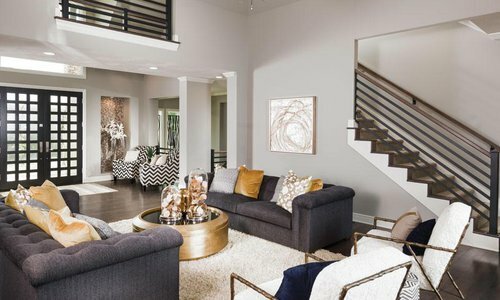 Of course, Amy and Travis added plenty of furniture and décor to make it their own, especially during the holiday season. 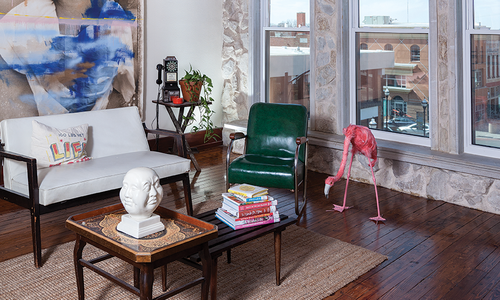 “I’ve always loved to decorate,” Amy says. 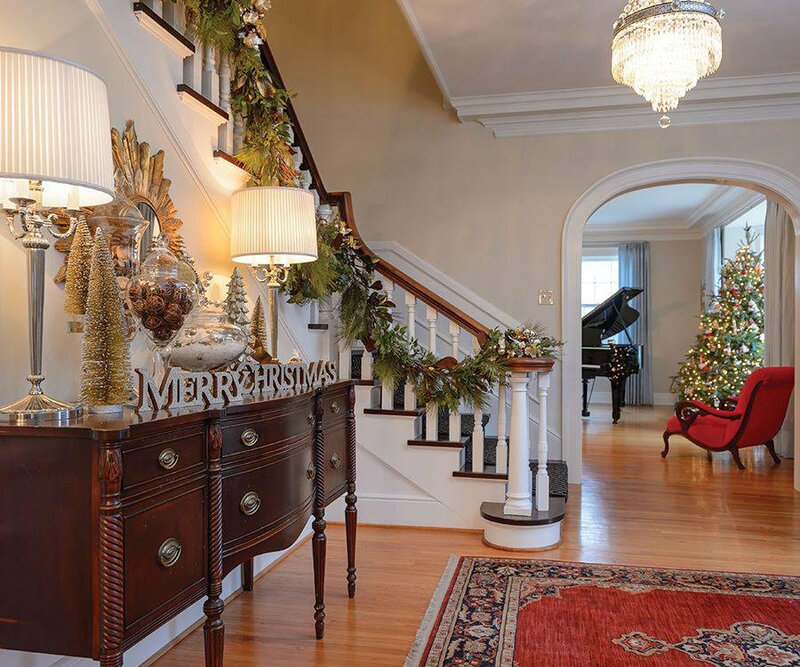 “My Grandma Giefer was an amazing decorator, and my mom has the same talent. 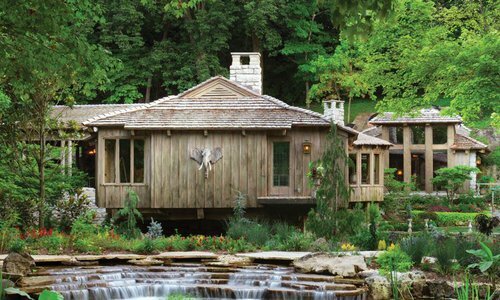 To me, holidays are meant to be celebrated with friends and family, and that means your house is decorated and full of food.” In addition to celebrating the holiday with her family, Amy and Travis open their beautifully decorated home up to friends—they hosted two Christmas parties last year. 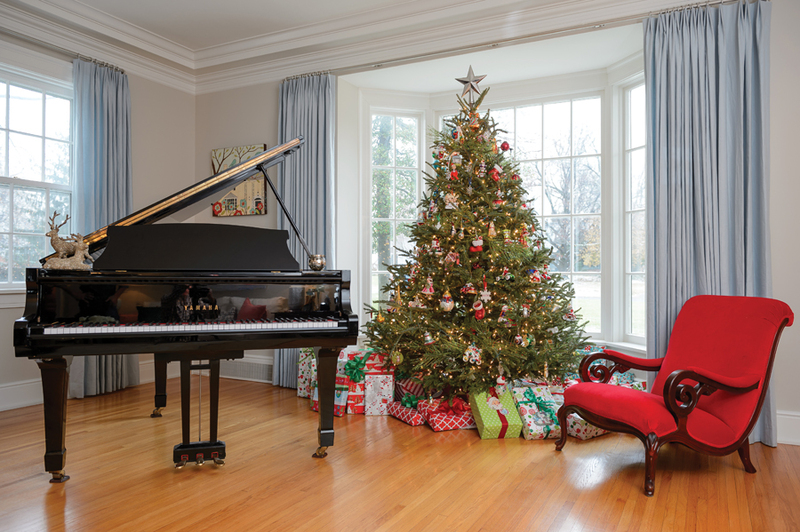 A traditional Christmas tree sits in front of the window in the formal living room. “This is the room where we celebrate and open gifts,” Amy says. Many of the ornaments on this tree came from Travis’s mother, Julia Hiles, who owns Hiles Two in Kansas City. “Every year at Thanksgiving, she gives every one of us an ornament from the store,” Amy says. Before the Hileses bought the house, they attended an estate sale for it, and Amy’s mom bought her the chair that now sits by the tree. The room also features a piano that Travis gave Amy for her 39th birthday. “I play, and the kids are all in lessons,” Amy says. 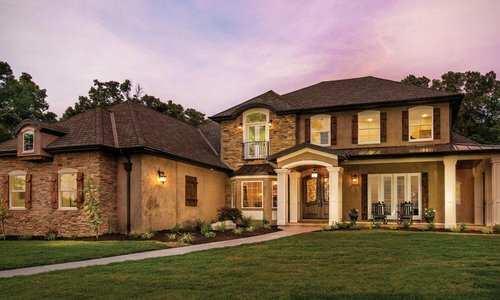 The room is finished with gorgeous crown molding that outlines its 10-foot ceilings. The windowsill in the kitchen is dressed with holly leaves from The Market, decorative trees from The Thicket and bells from Hiles Two. “A friend of my mother-in-law made the Santa,” Amy says. The dining room is home to an antique Baccarat crystal chandelier that was purchased in 1938 by Mrs. Landers. “The wall in here also still features the original hand-painted mural from 1939,” Amy says. A foil tree from Urban Market (Note: Since this article was first published, Urban Market is now Queen City Flea Market) sits in front of the room’s large bay window, and it’s decorated with ornaments from Amy’s mom and The Thicket. 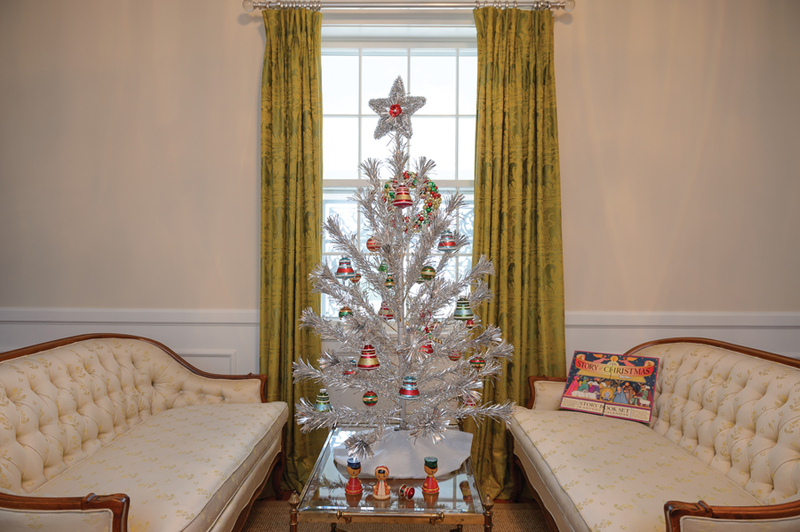 “My Grandma Lois Giefer had a foil tree in the formal living room,” Amy says. 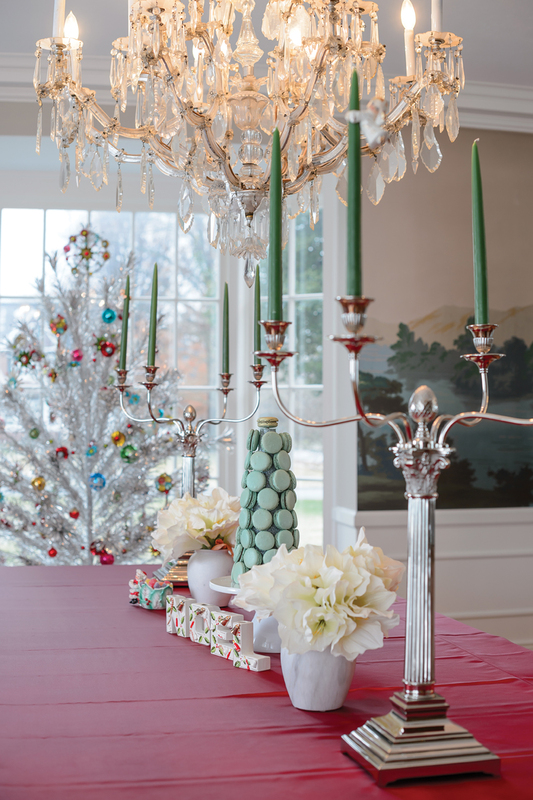 The dining table is dressed with vintage décor and a macaron tree created by Elle’s Patisserie (Note: Since this article was first published, Elle's Patisserie is no longer in business). A pair of vintage sofas from The Cottage flank a small foil tree in the upstairs landing, and antique silk curtains that originally hung downstairs border the window. The tree is decorated with more ornaments from Hiles Two. An Advent calendar book, which was a gift from the family’s old neighbors in Charlottesville, Virginia, helps the family remember the reason for the season. “While we try to make sure we have fun during Christmas season, we also make sure that we are remembering that Christmas is about Christ being born,” Amy says. 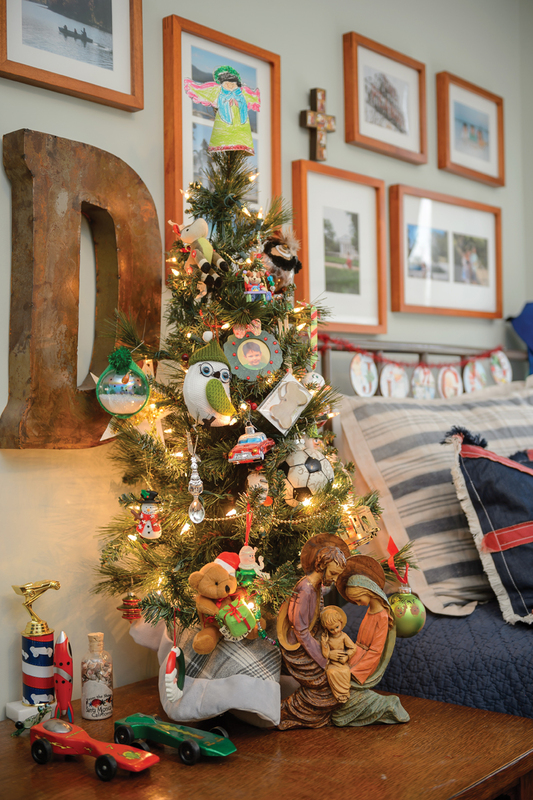 The top of their son Daniel’s tree features an angel he made at St. Agnes Elementary School, and many of the ornaments on the tree are green. “It’s kind of funny, but I actually have a color for all of my kids,” Amy says. “Henry is blue, Daniel is green and Rebecca is pink.” In addition to the ornaments on their trees, you’ll find these colors in several of the other Christmas decorations, including little Russian doll figurines in the upstairs landing. 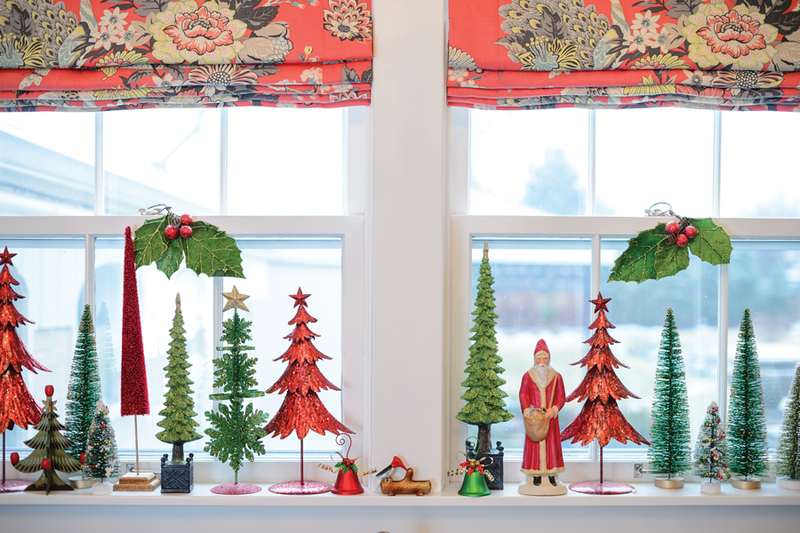 “I make sure that every kid’s room has a tree and a nativity,” Amy says. 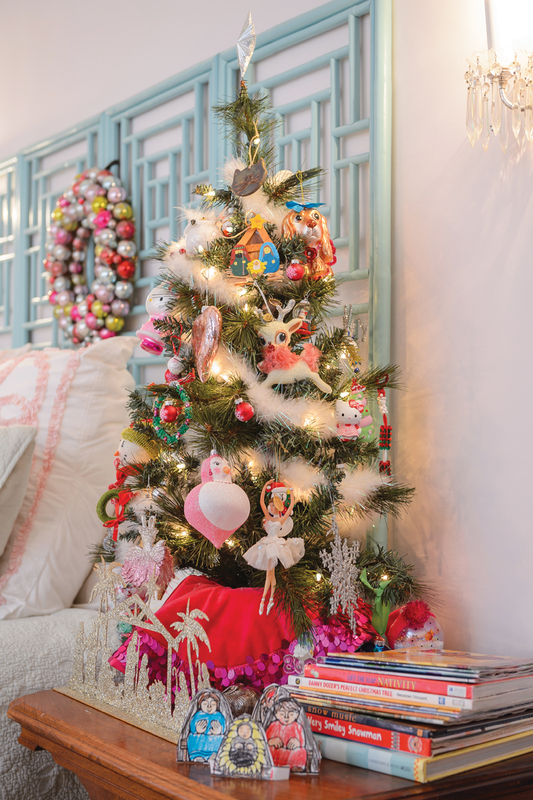 Rebecca’s tree is decorated with a variety of ornaments, including some made by Rebecca herself, plus a feather garland and a fun sequin tree skirt. A wreath from Amy’s mother hangs above her bed.